Hello, and welcome! Our big Sale-A-Bration Sale is coming to an end this coming Saturday, March 31, 2018. We are also headed to the end of the Stampin' UP! 2017 - 2018 catalog. It ends May 31, 2018. 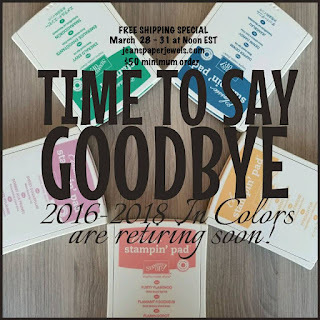 The five In Colors you see above will be retiring with the catalog. All the products that are included go so fast! I am offering a FREE Shipping Sale starting today, March 28 through Noon EST Saturday, March 31, 2018. You must submit your order directly through me to take advantage of this deal, as it is from me personally. Don't miss out!